In The Mood for Italian Feast! Italian cuisine can be so romantic, just like its people and culture. While some Italian restaurants tend to opt for casual comfort, Fuzio Bar & Ristorante takes on a refine and romantic concept. Located in the bustling city area of Jalan Berangan around Changkat Bukit Bintang area, the Italian bar and restaurant is set in a three-storey building with three levels of dining and bar. It’s my second visit to Fuzio. My first visit to Fuzio was to savor their collaboration with Jasmine earlier here. Glad to be back again at Fuzio and this round was to savor the restaurant’s menu of Italian cuisine. The warm glow of the soft lighting at Fuzio gave the restaurant a refine and romantic ambience. Fuzio’s owners also support local talents and displays talented art pieces all over the restaurant. 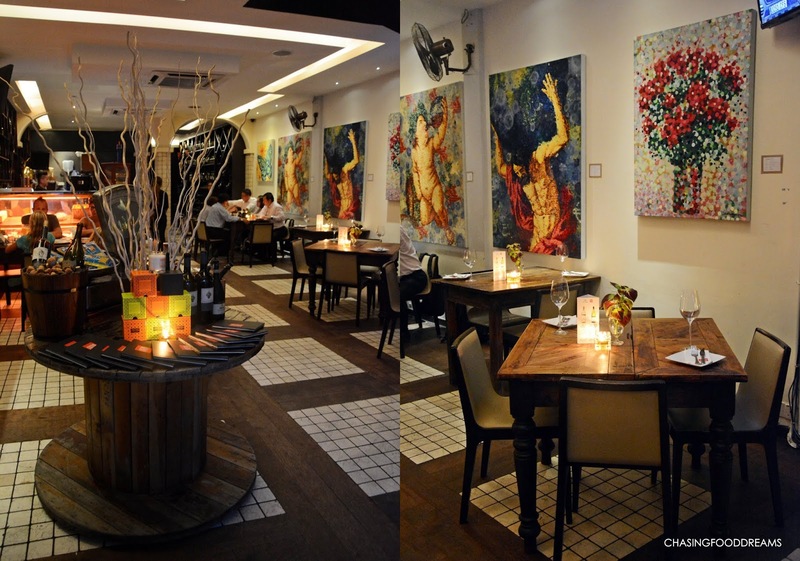 Diners or art fans will be able to purchase these beautiful pieces of art as well as admired them while dining. 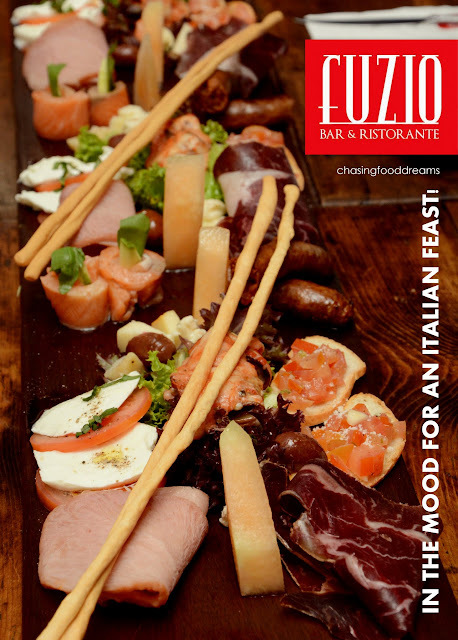 Fuzio’s menu is all about traditional Italian cuisine injected with their own modern twist. The Italian restaurant also offers a selection of wines to be paired with their menu. From Antipasti to Pasta, Pizza, Main Course, Small Bites and Dessert, the dishes here have a refine touch. Fuzio also has a full fledge bar list filled with lots of cocktails, beer, wine, liqueur and even Italian liqueur like Limoncello and Grappa. We unwind our evening with Fuzio Cooler and Lemon Juice since the next day was a work day. If you are game for some giggle juice, then you must order the Fuzio Killer, the alchohol version of Fuzio Cooler! Frankenstein, a cocktail that is just so gorgeous to look at and delicious as well! From the Small Bite menu, we had an order of the Deep Fried Calamari (RM24) while waiting for others to arrive. Simple but well executed lightly battered fried calamari goes well with the tartare sauce served. At Fuzio, one simply must order their Antipasti (RM88 for 2 or RM148 for 4). It is a tradition to enjoy a platter of Antipasti as the first course of a formal Italian meal. There were six of us and so we had a long board of scrumptious antipasti of Cecina ham, Lamb Salsiccia, Smoked Duck Breast, Salmon Carpaccio, Tomato Caprese salad, Eggplant Involtini, Tomato Bruschetta and cheeses such as Gorgonzola, Tallegio and Grana Padano. This was such an impressive sight and presentation. Our main course started to arrive and the first was the Spring Chicken Risotto (RM72). A whole spring chicken is stuffed with porcini risotto and roasted. It is served with a vegetable stack of eggplant, zucchini, carrot and peppers, grilled asparagus and a rich brown gravy. The chicken is tender, succulent and flavourful. When we cut the chicken to unveil the risotto, there was a delicious aromatic of porcini. The risotto is tasty and aromatic albeit a little soft. It’s a great pairing of ingredients in this dish. Creamagliera di Agnello (RM76) translated to Grilled Lamb Rack with Goat Cheese and Rocket Salad. Three solid rack of lamb grilled with a layer goat cheese is paired with a rich dark sauce. The tangy and creamy goat cheese went really well with lamb. The rocket salad lightly dressed was a great side to the meaty dish. If you prefer beef over lamb, then the Filetto di Manzo alla Griglia (RM78) or Grilled Angus Beef Tenderloin with Mushroom Cartoccio is another great choice. Cooked to medium rare as per our request, the tenderloin is nicely charred and so juicy. It is served with roasted potatoes, asparagus, mushroom baked with truffle oil and sauce. The mushrooms are just as good too with its lush truffle aroma and earthy flavours. High points goes to the premium quality of beef used as the meat as very flavourful on its own although sauce is provided on the side. My favorite main dish of the evening was the Merluzzo Al Forno (RM68) or Baked Cod Fish with Pesto Mashed Potato. A huge thick piece of cod was simply cooked to perfection. The cod was so sweet and creamy with a gorgeous silky texture. It was cleverly paired with pesto mashed, sautéed vegetable, lots of crispy leeks and a drizzle of reduced balsamic vinegar. A must-order if you love cod! Everyone enjoyed the Funghi Pizza (RM32). It’s got all the passing marks of a delicious pizza with thin crust nicely baked, hearty tomato sauce, mix of cheeses, lots of mushrooms and finished with more truffle oil. We could literally smell the beautiful truffle aroma even before the pizza was placed on our table. Our last main dish was Spaghetti alla Carbonara (RM38). Cooked the way an Italian would be proud off, the carbonara has pieces of smoked duck breast and mushroom in heavy cream sauce. For any cream sauce pasta, I always recommend everyone to enjoy this while hot for the best flavours. This version is extra rich and sinful with lots of moreish flavours. The smoked duck is not a classic ingredient used in carbonara but I certainly didn’t mind it because it gave the dish more flavours and it’s a good substitute for bacon. Desserts are a must in any Italian meal. It sweetens the Italian touch with more luscious cream, chocolate and sweetness. We chose their Tiramisu (RM28) Chocolate Flan with Gelato (RM28) and Panna Cotta with Mix Berries Sauce (RM24). The Tiramisu was pretty decent with its usual coffee soaked sponge, creamy and fluffly mascarpone, sprinkling of cocoa and rounded up with chocolate roll and strawberries. The Chocolate Flan had rich dark chocolate flavours with a hint of bittersweet note. It’s always a solid pairing of warm chocolate and vanilla ice cream. The Panna Cotta had also set beautifully and was smothered with berries coulis. Vanilla cream and strawberries is another marriage made in heaven when it comes to flavour pairing. We also had another Italian favorite of Affogato (RM18). Fuzio’s version will hit you hard with bold espresso notes and cold ice cream. Love it! !